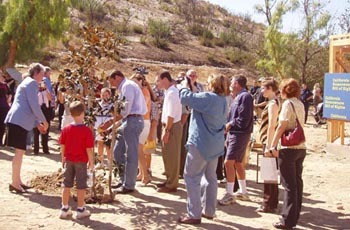 The Old Fire Recovery Group is a team of survivors from the Old Fire who have organized as a project of Community Partners. Our goal is to find the best information available and provide it at no cost to other fire survivors. A very big thank you to the Church which generously donated their facility to us for most of our meetings. A fire severely damaged their chapel a few years ago so they know the challenges faced with rebuilding after a fire and want to help their community. Please see BELOW for an archive of our workshop schedule. We are no longer having official events. The list which follows is a list of workshops we held in the two years after the fire. Some survivors have said they would like to invite everyone over when their houses are done. We will post it here (and announce it in our email newsletter) when someone is ready for an open house! QUESTIONS AND ANSWERS FOR FIRE VICTIMS! 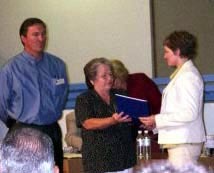 George Kehrer and volunteers from CARe, Inc. Survivors from other disasters were in attendance as well. 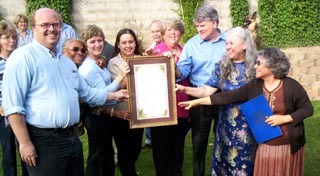 Between January 4 and July 18, 2004 we had at leats 20 weekly insurance workshops led by CARe, Inc.
Introduction of the Old Fire Recovery Group to the group. Click HERE for the agenda. Insurance Workshop George Kehrer and volunteers from CARe, Inc.
"Investigatory Hearing on Underinsurance and the Determination of Home Replacement Costs"
One Year Anniversary Picnic Barbeque and hot dogs by the fire department, organized by the City.Click HERE for a flyer. Up In Smoke: Can More Be Done to Help Fire Survivors Settle Their Claims? Representatives from the mayor's office, the city council, the state senate and the local press. We were presented a resolution from the state senate. Click HERE for pictures of the event! We are having our "New House Celebration" and are inviting all the Old Fire Recovery Group to come and see it ... it is an Open House-style get together for friends, family and all those who have helped us get home again. We would love to see you. Rebuild San Bernardino County and homeowners Jose and Olga Hipolito, cordially invite you to their House Blessing. Please join us as we celebrate their return home after the 2003 California Wildfires! Rebuild San Bernardino County was founded to help uninsured, San Bernardino County fire survivors a way to rebuild their lost homes.